Kitty Prozac: Can Synthetic Pheromones Calm Your Pet? Sara, a former shelter cat, has been luxuriating in my home for nine years. She's always been gentle yet skittish, the proverbial scaredy-cat. But after Sammya high-spirited (read: aggressive) 5-year-old rescued by the ASPCAmoved in with us two months ago, it was all-out feline war. Sara hissed, Sammy pounced, and I couldn't get much sleep. Desperate to end the territorial battle before my apartment got destroyedor, worse, marked with urineI decided to consult my fabulous (but fabulously expensive) veterinarian. I left her office with two pheromone collars, a handful of pheromone diffusers and the ardent hope that the chemical compounds would bring peace to the Sachs household. It's also no wonder that companies are racing to market more-natural alternatives. Scientists have known for a good half-century that animals communicate via pheromonesa word that stems from the Greek pherein (to carry) and hormoneto do everything from trigger alarm to soothe their offspring. In the past decade, synthetic versions of these chemicals have been making their way into consumer products. D.A.P. (dog-appeasing pheromone) sprays and collars mimic a puppy-pleasing compound emitted by canine mammary glands. And there are plenty of colognes and body washes that purport to use human pheromones to help attract a mate, although most experts agree that these people-centric products are effective only as marketing gimmicks. But research indicates that synthetic feline pheromones really do have a calming effect on catslike a kitty Prozac but without the pill. Numerous studies, in journals such as Veterinary Record and Applied Animal Behaviour Science, have found that Ceva Animal Health's Feliway pheromone sprays and diffusers help reduce stress-related behaviors such as urine marking, vertical scratching and aggression. Although each of the two manufacturers uses a different patented pheromone, there is no catfighting between them. To the contrary, says Larry Nouvel, a chemist who helped develop the Sergeant's collars, "I'd recommend that you use both." 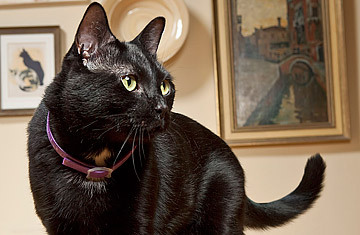 The collars mimic a soothing pheromone that mother cats emit while nursing, and Ceva's diffusers and sprays use a synthetic version of a facial pheromonewhich cats leave behind when they rub their cheeks on furniture or peoplethat signals that the territory is safe and secure. This article originally appeared in the November 15, 2010 edition of TIME.